The nmap 6.01 port scanning results upon a Nexus 7000 running NX-OS 6.0(4) showing that UDP Port 1434 is open or filtered. 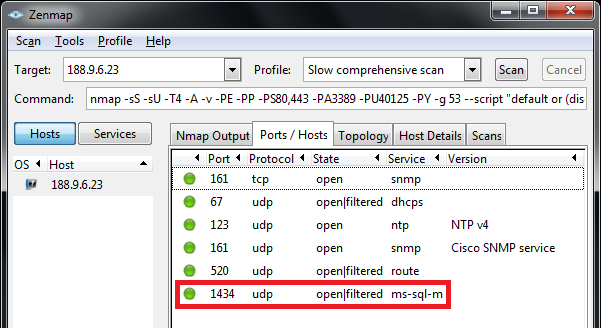 The packet capture shows that the Nexus 7000 never reply to any packet destined to UDP port 1434. However, it replies upon the packet destined to UDP port 1433 with an ICMP Port Unreachable message. UDP Port 1433 is MS SQL Server. UDP Port 1434 is MS SQL Monitor. Preventing NX-OS to generate ICMP Unreachable messages with the no ip unreachables interface subcommand (a very common Cisco IOS hardening command) is not sufficient, we need to also prevent NX-OS from generating ICMP Port Unreachable messages with the no ip port-unreachable interface subcommand, in order to prevent NX-OS from leaking information to port scanning tools.